This is the game I spent the most time with at the show. I had almost an entire hour with a near final version of the game. The Natsume rep, who happened to be one of the staff in charge of localization for the game, informed me that the only major part of production that was left to finish was the English voiceovers. Which are being handled by the same group who did the voiceovers for Rune Factory 3 on the Nintendo DS, which were top notch if I do say so myself. I decided to start a brand new game file. There are two main characters Aden and Sonja, but after a series of events they become one. Well Sonja’s being is inside of Aden and Sonja’s body is nowhere to be found. I know, it is a little strange. As always with Rune Factory and Harvest moon games you are found by a local who brings you into town and gives you your own house. This is where the game really begins. The game offers a plentiful amount of villagers to introduce yourself to in town. The town itself is very large, comprised multiple sections with much to do and see. I was blown away by how good the game looks especially the town. The game runs very smoothly at 720p on the PS3 and appears crisp but you can tell that the game was designed to run on the Wii primarily, as it isn’t as detailed as most PS3 games are. 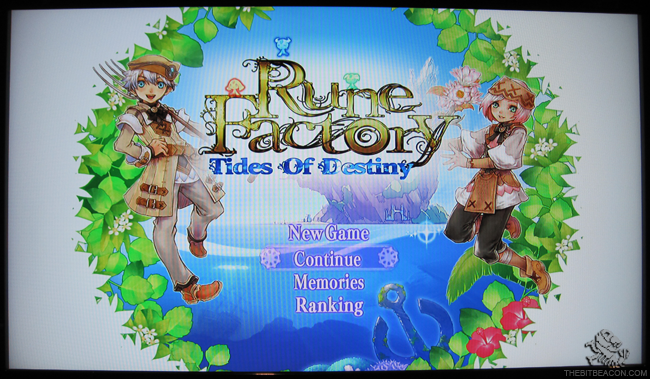 Still it’s a huge leap for the Rune Factory series. I got a brief taste of the combat which is similar to the previous games but paced more quickly. I used dual swords so I was slicing and dashing all over the place during fights. You can knock enemies up and then jump and continue to fight them in the air. If you keep a chain of attacks going on long enough you will perform special finishing moves which are flashy and fun to watch. It comes off as a bit button-mashy, but keeping your combo going can prove to be a challenge. I did not get to check out the farming aspect of the game, but the Natsume rep said it has taken more of a secondary role in the game and your tamed monsters will do most of the work. He also noted that certain monsters will do a better job at maintaining your farm than others and crops will turn out differently depending which monsters you use. I asked about the length of the game and was told the game will take anywhere from 40-70 hours to make it to the end, depending on how many extra side quests and diversions you take part in. Rune Factory games have always had a smaller audience, not because they are bad games but because they require a certain kind of person to play them. The ‘Japaneseness’ of the games is very strong and Marvelous/Neverland Co. have done nothing to attempt to appeal to a wider or western audience. It is thanks to great companies like Natsume that bring these wonderful titles to life for the small but growing audience of gamers who enjoy traditional Japanese games in the west. 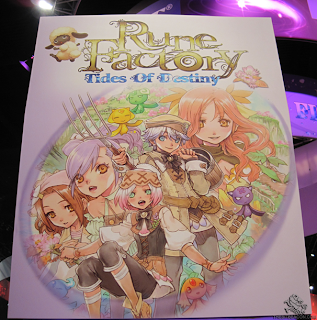 Rune Factory: Tides of Destiny will be coming to Wii and PS3 sometime Fall 2011.